In addition to the Netherlands, Apple has revealed that iTunes Match is now available in 18 additional countries throughout Latin America and Europe. After updated terms and conditions signaled the arrival of iTunes Match in the Netherlands on Monday, Apple has also begun quietly rolling out the service to numerous other countries. A total of 37 countries can now access iTunes Match. The list of new countries to receive iTunes Match includes: Argentina, Bolivia, Chile, Colombia, Costa Rica, Dominican Republic, Ecuador, El Salvador, Estonia, Guatemala, Honduras, Latvia, Lithuania, Nicaragua, Panama, Paraguay, Peru, and Venezuela. Most of the countries on the list only just received the iTunes Music Store. In December, Apple's iTunes Music and Movies stores became available in 17 Latin American countries. Apple first launched iTunes Match last November, after a slight delay that pushed the release past the company's original goal of October. The cloud-based service then spread to a few other countries in December. The rollout experienced a few hiccups, however, as the launch appeared to take place prematurely and some problems persisted even after the official release. 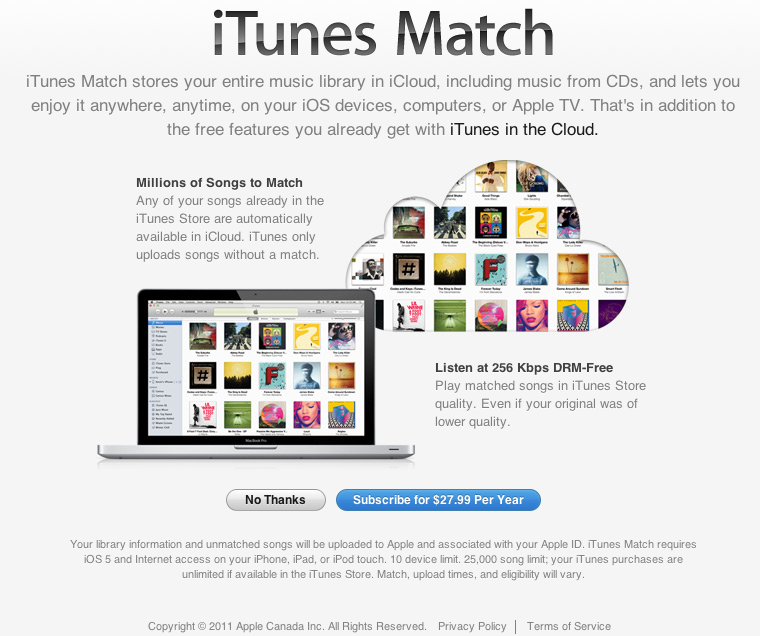 iTunes Match allows users to access in the cloud music they own that was not purchased on iTunes. For an annual fee, Apple will scan and match customers' music libraries with its own catalogue on iTunes and add matched songs to their iCloud accounts. Music that is not offered on iTunes will then be automatically uploaded to iCloud, though those songs will count toward a user's allotment of space. Though analysts do not view the service as a highly profitable venture for Apple, they do see it as a substantial contribution to Apple's iTunes ecosystem that will help drive hardware sales. Piper Jaffray's Gene Munster expects iTunes Match to run at just above break-even, similar to its App Store and iTunes Store. According to his calculations, iTunes Match could generate just $169 million a year. That's a drop in the bucket for Apple considering it's expected to announce roughly $40 billion in quarterly revenue next week.